Encyclopedia of Tours and Travel to Tripura, featuring information on Fairs & Festivals, Wildlife, Excursion, Adventure and Weather of Tripura. The Unakoti Tirtha is a unique place, which can not be compared to any other place in the country in terms of absolute grandeur and artistry. Unakoti is deservedly reputed for its 7th - 9th century AD stone and rock cut images, deep in the forests near Kailashahar. Unakoti literally means one less than a crore (10 million) i.e. 99,99,999. The place does not have that many rock-cut sculptures, but these hundreds of massive rock-cut sculptures and those made out of sandstone, besides scattered ruins of ancient temples make Unakoti a unique place. According to Hindu mythology, when Lord Siva was going to Kashi through this place, along with one crore other gods and goddesses, he spent a night here. He had asked his followers to wake up before sunrise and proceed for Kashi . But, unfortunately, no body woke up, except for Lord Siva himself . He cursed them to become stone images. That is why we have one less than a crore stone images there. 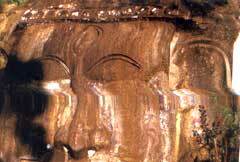 The images found at Unakoti are of two types namely rock-carved figures and stone images. The famous rock cut carvings are the central Shiva head and gigantic Ganesha figures . The central Shiva head known as ‘Unakotiswara Kal Bhairava’ is about 30 feet high including an embroidered headdress which itself is 10 feet high. On each side of the headdress of the central Shiva, there are two full size images of goddesses - one of Durga standing on a lion, while the other one is believed to be that of Ganga astride a capricorn. In addition three enormous images of Nandi Bull are found half buried in the ground. There are various other stone as well as rock cut images at Unakoti. Every year a big fair popularly known as ‘Ashokastami Mela’ is held in the month of April which is visited by thousands of devotees. Unakoti houses the largest Bas relief sculpture in India. Another three-eyed figure a little far away is believed to be that of Surya or Lord Vishnu. A huge Ganesh figure is also carved in the Unakoti complex, while there is also a chaturmukha Shivlinga nearby. Among other rock-cut and stone images are those of Vishnu, Nandi, Narasimha, Ravana, Hanuman, and several unidentified deities. The consensus among archeologists is that although the predominant impact of the Shiva cult is obvious, the sculptures were also influenced by several other cults like Tantric, Shakti, and Hatha yogis. It is also assumed that the site dates back to the period between the 12th and 16th centuries AD, and that the sculptures belong to two different periods of art. By Air : Kailasahwar town is connected with bi-weekly Indian Airlines flights from Agartala. By Road : To get to Unakoti, one can hire a taxi from Agartala, the state capital. Accomodation is not a problem at Unakoti, Tripura. You can easily find an accommodation of your at this location. Best time to Travel : October to March. Weather : Hot & Humid. Location : The Unakoti Tirtha is located about 180 km from Tripura's capital, Agartala, and just about 8 km from the sub-divisional headquarters of Kailasahwar town.